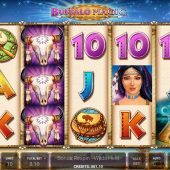 Novomatic take us to the plains of North America here with Buffalo Magic slot, an Indian themed game with reels of hide and a prairie background but alas no tribal music to complement the silent spins, with only a trotting sound when the reels stop. Novomatic have never gone big on complex graphics and animations and this is echoed in their last visit to the theme, Indian Spirit but they've kept away from the buffalo itself here which seems to feature in many slots of late, such as Playtech's Buffalo Blitz and Blueprint's Megaways game Buffalo Rising. 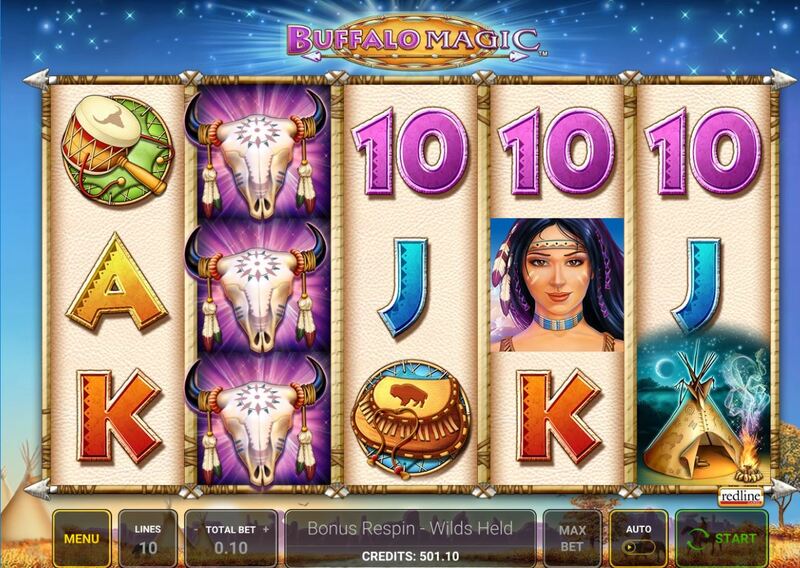 In fact, given that 'buffalo' is in the title it may seem rather odd that it's disappeared from the game altogether - let's hope our bankroll doesn't do the same! Buffalo Magic has 10 paying lines left-to-right only over 5 reels of 3 rows each. Icons are single and we should therefore anticipate some decent 5-of-a-kind pays; Hiawatha 200x, the Saddlebag 100x, Drum 50x, the Horn and Headdress both 30x and five card values paying 20, 15 or 10x. There are Tepee scatters on reels 1, 3 and 5 so at least we know a bonus is possible, but what about the Wilds? Well, the buffalo does appear but alas he's deceased and we get his ceremonial decorated skull on reels 2 and 4. Any Skull appearing on 2 and/or 4 will expand to a full-reel Wild and you will be paid and then get a re-spin. If the other one appears you will be paid again and a final re-spin given before the total wins are calculated. Having landed the three Tepee scatters on reels 1, 3 and 5 you will be given 10 free games. You can't retrigger them as such but you can get 5 extra spins for 3 more scatters and then that's it - your spins are capped at 15 maximum. You enhancement here is simple: any expanded Wilds that land remain in place for the duration. If you've played WMS' Black Knight 2 then you'll get the idea.